As you all know, the new year is a time for starting over, for instilling good habits and for watching your waistline. 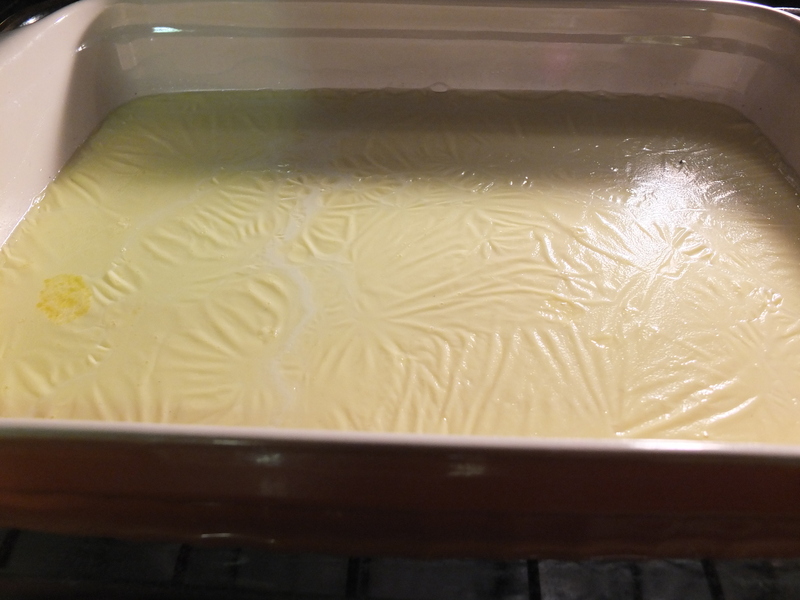 Which is why I am posting a recipe that consists of nothing but condensed whipping cream. Because who are we kidding- those resolutions aren’t going to stick, so we might as well skip all that painful self discipline and get on to the good stuff. All joking aside, I am posting this recipe because it was a project I was working on as a Christmas gift for the hubby, and I didn’t want to post it during the Christmas season for two reasons- One, I didn’t want him seeing what I was up to, and two, I wasn’t sure it would even work. Here’s a longish back story or two for interest and clarification. My father-in-law used to run a dairy farm on the southwestern tip of England, near Cornwall. Because of this, he is a veritable mine of information concerning all things dairy. You have to be careful asking him any question regarding cows because he is likely to turn quite encyclopedic on you, and you might not be able to get away for a couple of hours. It’s all very interesting stuff however, if you like dairy, which I do. I remember having a discussion with him once about the making of butter and cheeses and other things, and the term ‘clotted cream’ came up. My blank look told him that I had never heard of such a thing, so he rectified the situation immediately. He told me in lavish detail all about it, starting with it’s many names- clotted or clouted cream, Devonshire cream or Cornish cream, depending on who you ask. Being an Englishman, he was even able to tell me the slight variations one could find depending on what region you were in and if your palate were discerning enough. But I don’t remember all that. 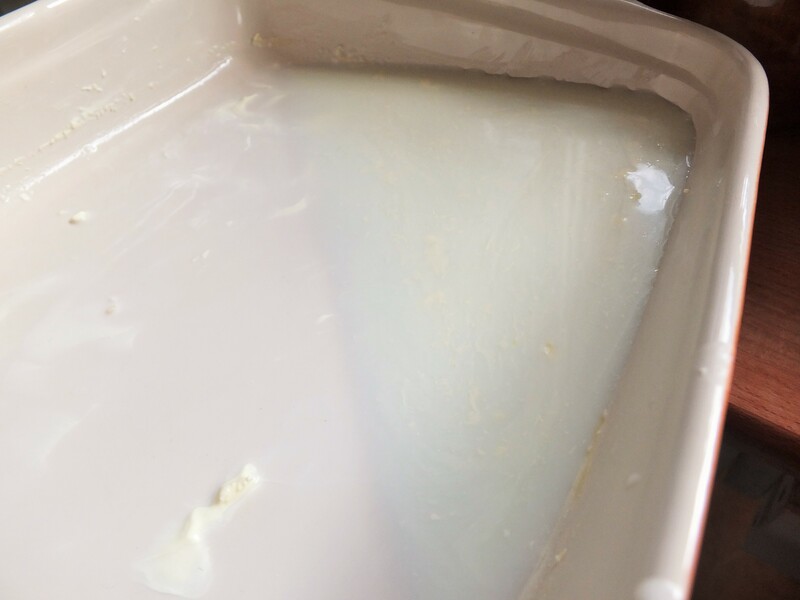 For all intents and purposes I found that it is a product that comes from cooking fresh, unpasteurized cream at a very low temperature for a very long time until the cream condenses on the top. Then you chill the result and spread it on something like a scone. My hubby was also listening in on the conversation, apparently unaware that he was drooling as he reminisced about the few times he had been able to enjoy this treat as a child when visiting family in England. I took note of the longing look in his eye, and began my mission- to find clotted cream in America. And although it was tasty, it wasn’t quite what the hubby had remembered. After all, it had been made and processed in some way to keep it from going bad, and then shipped half way around the world where it had probably been sitting on that shelf a long time. I didn’t buy it again. At any rate, he tried to make it just using the directions his father had given him all those years ago, letting it heat in a pan on the stove for a long time. We had no idea if it was turning out right or not, but he decided to take it to a friend’s house where we just happened to be invited for a fancy tea. 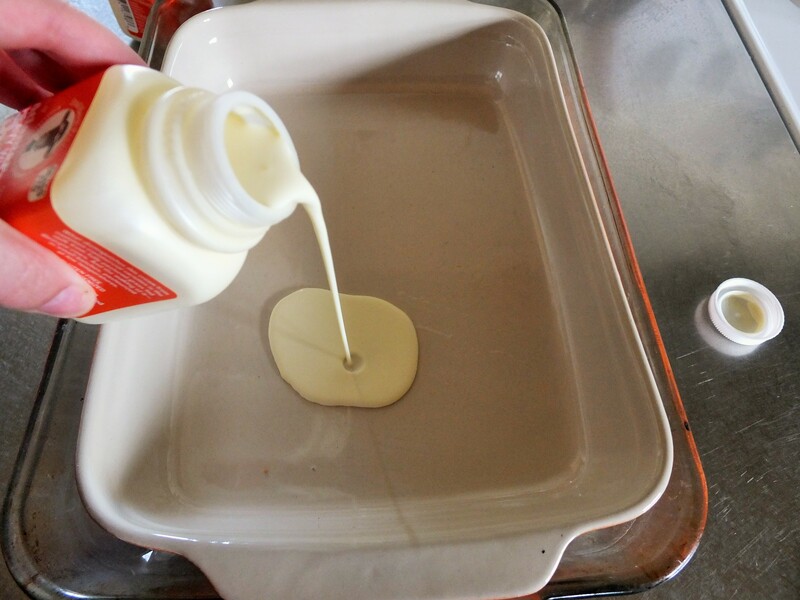 He hadn’t skimmed the cream off the top, but just brought the pan- liquid and all- into the car. He asked me to drive so he could hold it on his lap, but then realized he had forgotten something inside, and so set it on the dashboard. He slammed the car door, and before I could stop it, the whole pan slid off the dash and landed on his seat, deluging everything in it’s path, including myself. It really was a horrific mess, and it took so long to clean it up that we were very late to our tea party, sans Cornish cream. We were never fully able to clean up everything that spilled in the car that day, and even now, on hot days, you can still get a whiff of it. We didn’t try again. Fast forward a few more years to when my father-in-law came from France for a Christmastime visit. 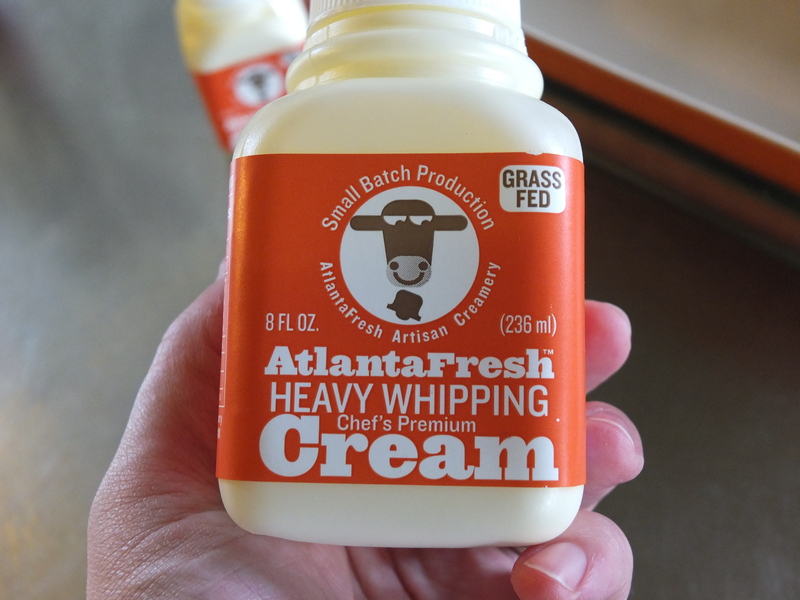 In honor of his arrival, the hubby and I hunted high and low online until we found a little site that sold Cornish Cream. They charged a ruinous price for it, but we bought two jars anyway, and it arrived straight from Cornwall a few weeks later. My father-in-law was pleased with it, as well as my hubby, as testified by the fact that they polished both jars off in an astonishingly short time. But apparently it still wasn’t quite right- it lacked that fresh, creamy, straight from the cow taste. And it was just too expensive to make a habit of buying. I decided it was time to abandon my mission. Apparently the stuff was not to be got unless you were able to make it yourself, and that was something I was sure I couldn’t do unless I bought a cow. 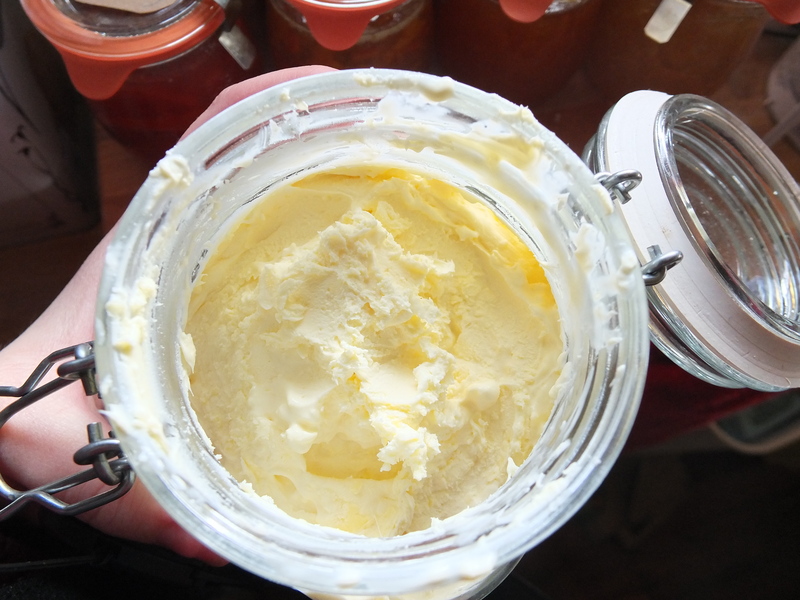 I never thought to look again until a few months ago, when I was hunting for a good orange marmalade recipe (which my hubby also loves) and I saw a link to a recipe for Cornish cream in the side bar. To my amazement, it said that it was indeed possible it make it yourself- using just a crock pot and cream that had not been pasteurized at ultra high temperatures. It seemed too good to be true, but I thought it was worth a shot. I had to stop at three different grocery stores before I found the right kind of cream, and I bought two quarts just in case I messed up a batch. I was really nervous when I poured all that cream into my crock pot and set it on low. I hovered nearby for several hours, checking it constantly. Even so, it began boiling and got overcooked. I think my crock pot was just too hot. 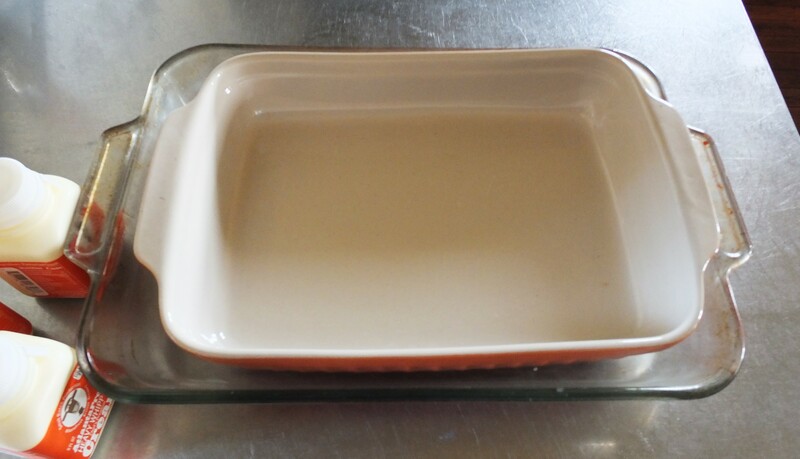 Nearly in despair, I searched the internet again and found one last tip- try making it in the oven in a water bath. I went ahead and did it, even though I had little faith left that it would work. But folks, this time it worked beautifully. I can’t describe to you how excited I was to scoop up that wonderful, creamy concoction and put in a jar for my hubby to open on Christmas morning. And at long last, after one taste, he had nothing left to ask for except another bite. 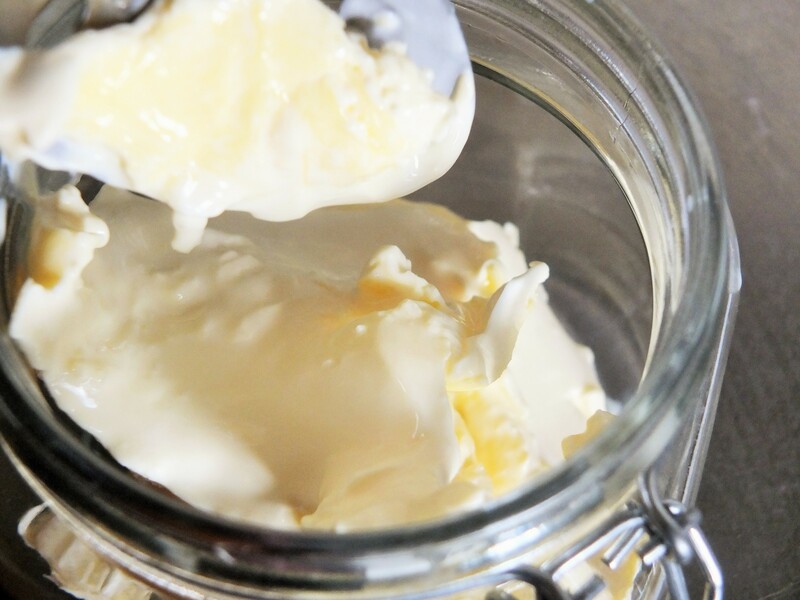 Now, I am well aware that some of you might think we are totally crazy, being so obsessed by something as trivial as a jar of cream, but I suggest you try it and see. You just might find yourself joining our little club. Here’s what you need. Yep. That’s it. But be very careful to make sure that it doesn’t read UHT (ultra high pasteurized) anywhere. 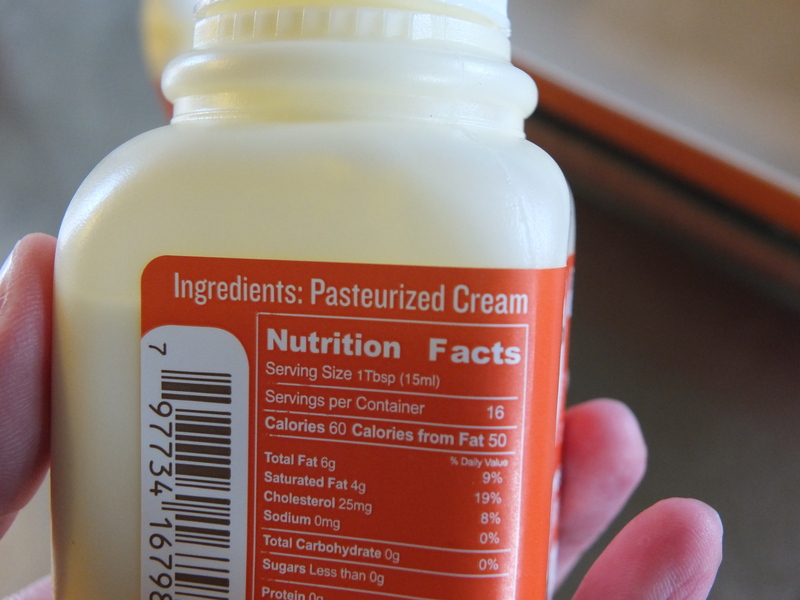 It should just say pasteurized, like this. I found this at Whole Foods. 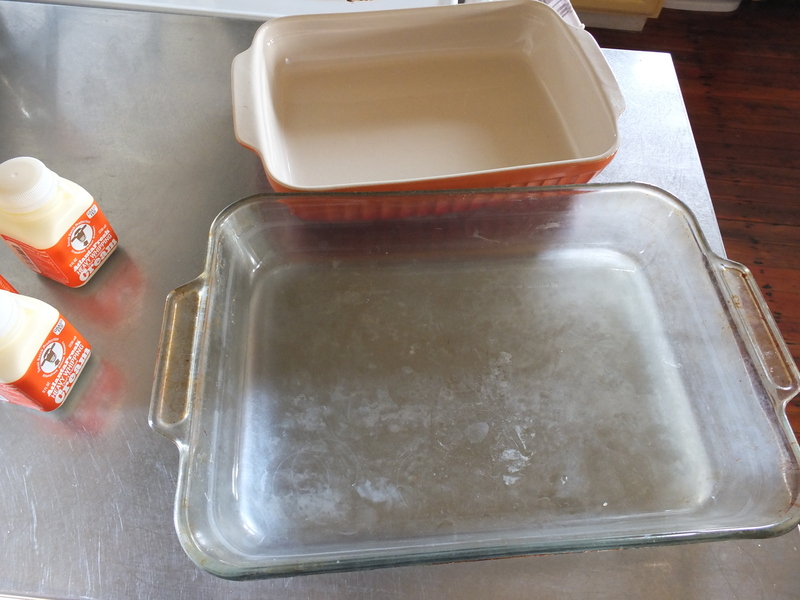 Now get out two pans- one that fits inside the other. 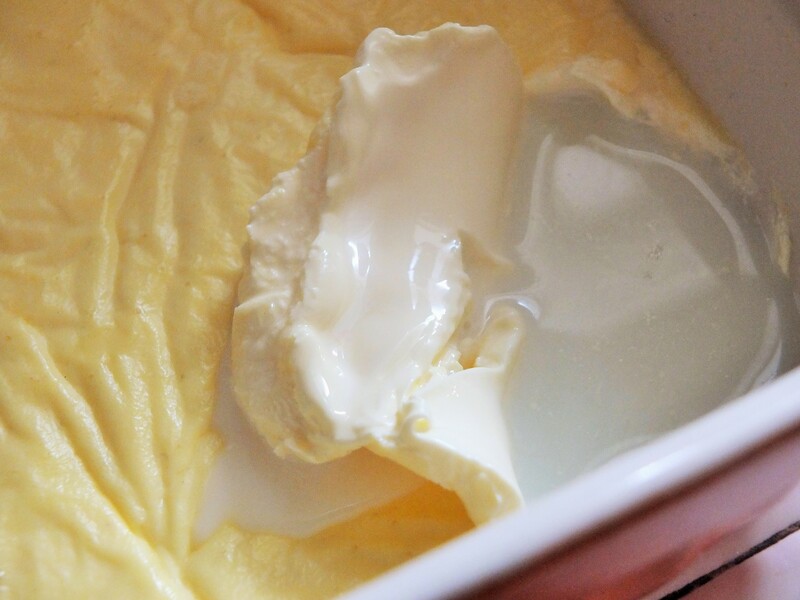 The bigger the better, since you will get more surface area and hence, more cream. I used an 11×15 and a 9×12. 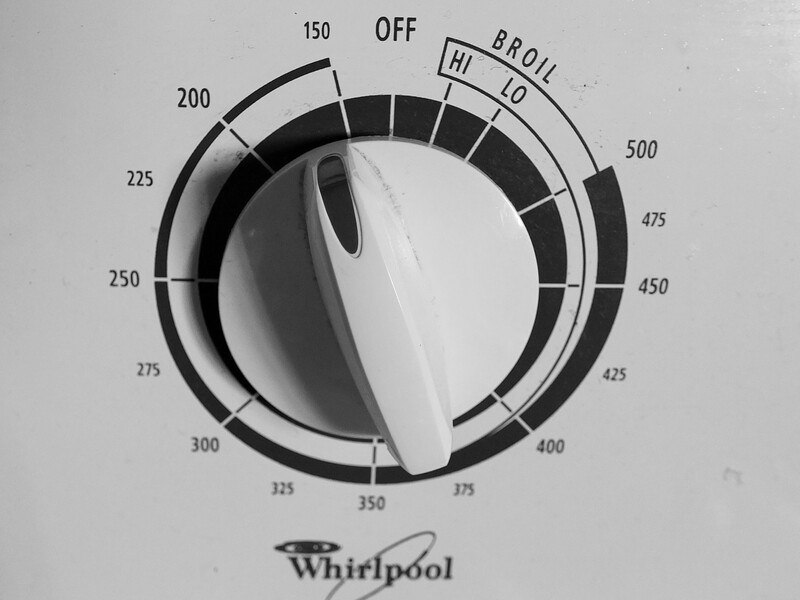 Preheat your oven to the lowest possible temp- mine is 150. It won’t take long to heat up. 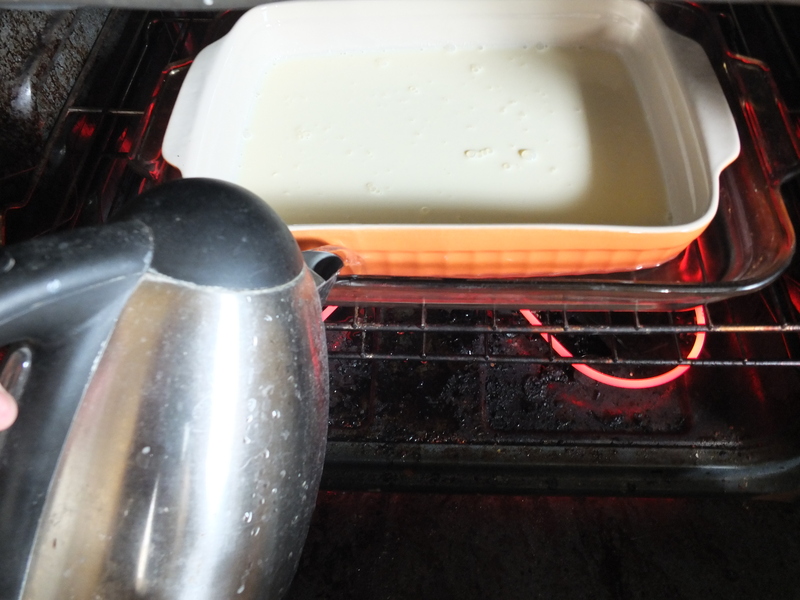 And place the cream in the oven. Now pour some water (it doesn’t have to be hot) into the outer pan until it reaches about half way up the sides of the inner pan. This is your water bath. And close the oven door. I put this in the oven around noon and pulled it out right before dinner- about six hours. Half way through, I checked on it and it looked like this. I know, it looks weird, but that is how it should look- like the skin that forms on the top of a pudding. 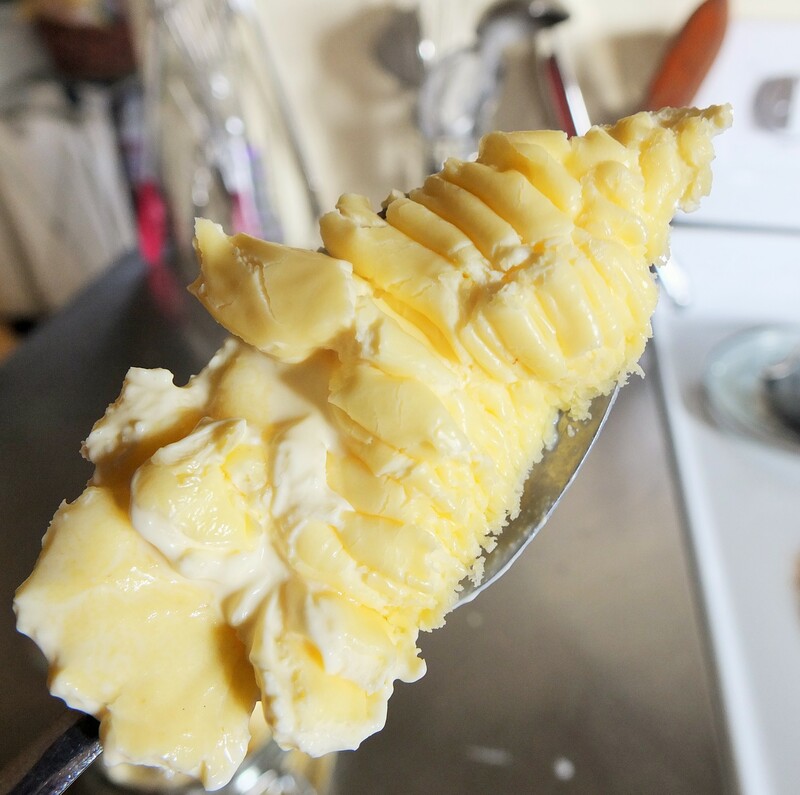 Just don’t disturb it- you want that layer to get nice and thick. I know, still strange. But keep going. Get a slotted spoon and sterilized jar ready to go. 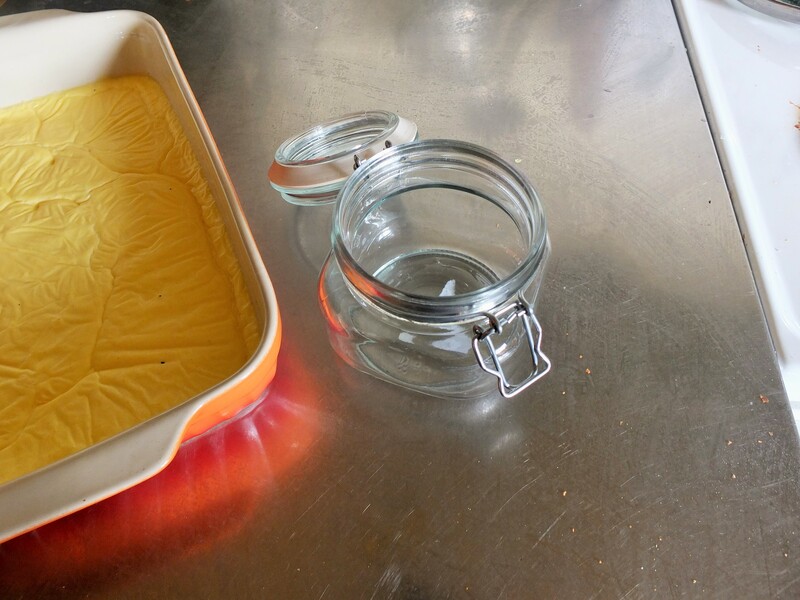 Now gently stick the spoon into the corner and start scooping, letting the liquid underneath drip off, and put the top layer into the jar. 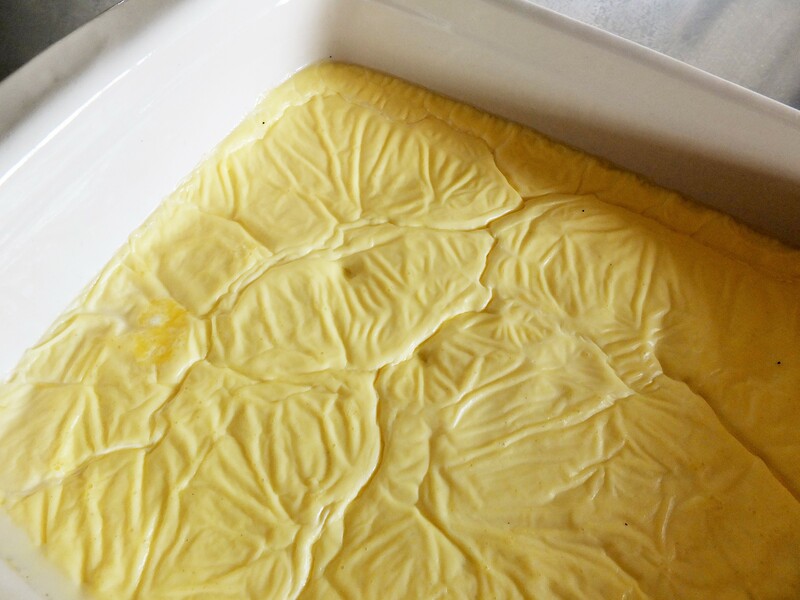 You will notice that it looks a lot like butter, but the taste is totally different, which is quite amazing really, seeing as they are made from the exact same ingredient. Keep scooping and filling the jar. In the end, you will have about a cup of leftovers in the pan. It’s sort of like whey, but much creamier. You can save it to use it in other cooking or in the scone recipe I am going to post later. But after the rest of it has all been spooned into the jar and stirred gently together, you should end up with about two cups of this marvelous, delightful, sinfully delicious stuff. Just stick it in the fridge and wait for my next installment in this series. 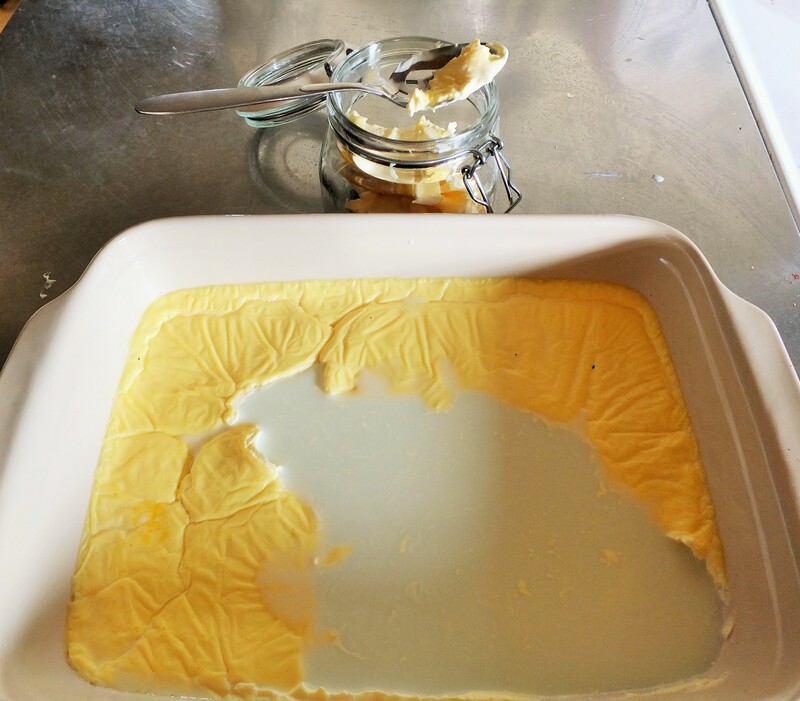 I’m going to call it “Cornish Cream and Lemon curd- the quest for the perfect scone.” Stay tuned.